Matt Sydal pinned Cedric Alexander with the Sydal Press in 11 minutes. Moose pinned Mark Briscoe with a spear. Matt Taven and Michael Bennett beat Christopher Daniels and Kazarian and Karl Anderson in a Triple Threat Match. Roderick Strong pinned BJ Whitmer with the STRONG BREAKER. Maria gets the microphone and tries to get out of the match by claiming she's pregnant but it's a set up and leads to Michael Bennett attacking ODB. ODB pinned Maria Kanellis with the TKO. IWGP Champion AJ Styles pinned ACH in an excellent match with the Styles Clash. Alberto El Patron-Jay Lethal video package. ROH Tag Team Champions Bobby Fish and Kyle O'Reilly beat The Young Bucks in an excellent match with CHASING THE DRAGON. ROH TV Champion Jay Lethal pinned Alberto El Patron with the LETHAL INJECTION. Samoa Joe comes out and gets the microphone. Joe says that it's good to be home. Joe says that 13 years ago in the bad part of Philadelphia in the Murphy Recreation Center to lead a revolution of guys who wanted to bring pro wrestling back to pro wrestling fans. Joe says that he couldn't think of a better time to return then to the main event to watch four hungry guys battle it out for the ROH Title and basically challenges the winner BECAUSE I AM SAMOA JOE, I am your NEXT ROH WORLD CHAMPION and I AM PRO WRESTLING. 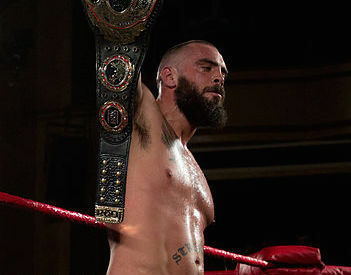 ROH World Champion Jay Briscoe beat Hanson, Michael Elgin and Tommaso Ciampa in a Four Corner Survival. During the bout referee Todd Sinclair was taken out. Three masked men jump in the ring and attack everyone until Raymond Rowe runs them off. Match ends with Hanson landing a spin kick on Elgin but Jay falling in to the cover. Show ends with Samoa Joe and Jay Briscoe having a stare down in the middle of the ring over the ROH Title belt. Very good show overall with some great matches and a big return. Please check this show out.